I want to introduce you to one of our dear neighbors. Her name is Eh Moo, and she is part of an ethnic group known as the Karen. Her best guess for when she was born is the mid-1920s. She was born in a mountain village in Burma, where the people worked as subsistence farmers. Decades of war and instability, persecution, and horrendous human rights abuse have caused the Karen people like Eh Moo to flee their villages and try to survive in refugee camps. Today, Eh Moo lives in South Nashville, along with multiple children, grandchildren, and great-grandchildren. The family is very close-knit, and all help one another. 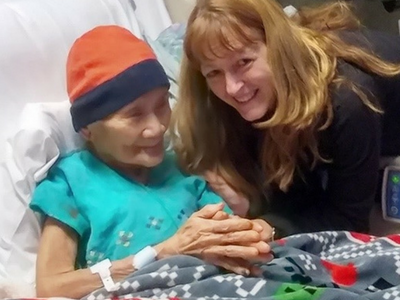 When Eh Moo was hospitalized recently for pneumonia, her teenage great-granddaughters took turns staying at the hospital to help the nurses communicate with her. Please remember Eh Moo, and others like her, in your prayers. Copyright 2017 Nashville World Outreach. All Rights Reserved.